Harman has been a leader in automobile audio and video tech for years, and their latest “driver distraction” correction tool continues to raise the bar for the international company. As a partner designer for top of the line Mercedes Benz and other luxury vehicles, Harman will soon introduce its driver monitoring system into the mainstream. This system, first showcased at CES 2016, features a proprietary eye-tracking software that changes the environment of the vehicle to compensate for the attentiveness of the driver. Your Eyes Make Your Car Smarter! The old wives’ tale that “you can see the soul of a man through his eyes,” has actually been proven true through science. The dilation of the pupils has a direct correlation to the vigilance of an individual. In particular, highly dilated, highly active pupils signal a tired driver. People who are trying desperately to stay awake while “doze driving” literally overload their brains trying to stay awake. The pupils widen to compensate for the lack of brain activity, and the eyes move haphazardly because there is less of the brain available to control them. 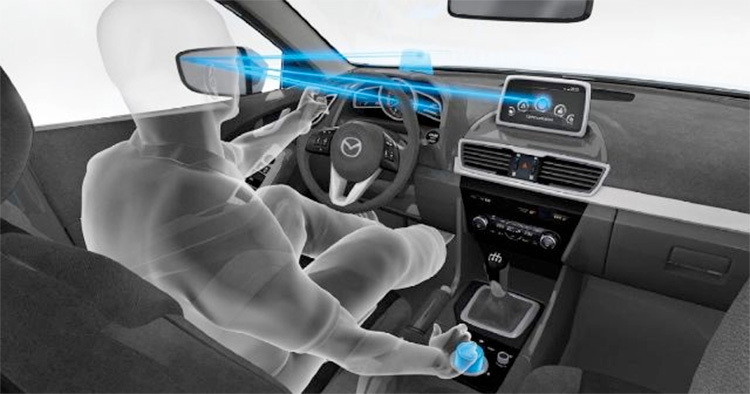 The Harman technology can pick up this behavior and adjust the environment inside of the vehicle to reduce the probability of a dangerous situation. The tired driver is not the only dangerous driver on the road. An individual who is multitasking too much while driving will experience the same physical phenomenon as a tired driver. Namely, the pupils of the eyes will dilate and begin to move in an uncontrolled fashion. If a driver is listening to the radio, talking on the phone or texting, dealing with a child in the backseat and trying to drive, of course there is a higher chance of an accident! The Harman system will actually switch the vehicle into a “do not disturb” mode that creates a safer environment for everyone involved. What Exactly Does the Harman System Do? The camera on the Harman system is a driver facing device that maintains constant contact with the pupils of the eyes of the driver. The system is integrated into the other smart car features much like an alarm system. This deep integration allows the safety features to implement themselves completely based upon the behavior of the driver. If the radio needs to be turned down or completely off, this happens automatically. If the windows need to be cracked or the temperature in the car adjusted slightly, it can be done quickly to avoid a dangerous situation. Can This System Be Used in Other Situations? The first public showing of the Harman was so successful that other businesses began to inquire about its usefulness in the workplace as well. Employers who are looking to increase the productivity of their staff may now have an outlet to automate the process without hiring more management as an office overseer. The Harman system may actually benefit drivers in more ways than one. Insurance companies often give lower premium rates for automobile owners for reducing the risk of driving. The Harman system definitely does this, and the company is currently in talks with top insurance companies to codify the benefits these safety features provide into their policies. Is the New Technology for You? This Harman technology is certainly a great add-on if you can afford it. However, Harman is known for being quite expensive, and the rollout may not trickle down to your vehicle for quite some time if you are not driving high-end luxury! However, you can use the knowledge of this system to save yourself money on automobile insurance. Traffic schools are just as viable as the new Harman system as an insurance buffer, especially if you enroll yourself voluntarily with a good driving record. Until you have a chance to earn your safe driver discount from implementation of the Harman technology, you can still do it the old-fashioned way.